Almost Mine is a bit of a different animal for me, writing-wise. I truly believe in happy endings (even if I put my guys through the wringer getting there), yet this story addresses an issue many of us can relate to: depression--not only how it affects the individual suffering from the illness, but how it impacts their family. Sometimes situations aren't always what they seem at first glance. Eden has done a marvelous job of presenting some very difficult topics. She succinctly and effectively reminds us is to pay attention to those we love because they are very precious. Don't take anything for granted because if you are not constantly vigilant, your life can change in a second. I recommend this to those who like a story with angst, intensity, and hard-earned love. Thank you, Eden, for this poignant, well-written story. 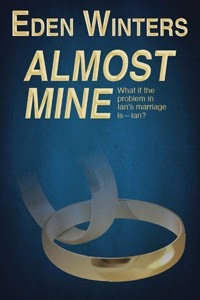 Almost Mine, available now from Rocky Ridge Books. Hi Eden, just wanted to say I read this story not to long ago, it was awesome and I really, really enjoyed it. Aww... Thank you. I'm so glad you enjoyed the story. Life is short and you never know what lurks around the corner. Don't worry, be happy!